The NZBA member benefits portfolio includes preferential pricing for office products and services. These are available to members of the NZBA and in some cases, their families and support staff. Please note that the the inclusion of any product or service provider into the NZBA member benefit scheme does not mean that the NZBA endorses the particular product or service providers. Members will need to conduct their own due diligence. Their all-inclusive & cost effective accounting packages and services are tailored to suit each client's specific needs and can be scaled as required and with a fixed monthly fee, you'll know what you will pay in advance. KPMG offers NZBA members the first 2 months free on their fixed rate accounting packages as well as set-up and *Xero training provided for free (*where applicable). Click here for more information about KPMG Enterprise. Your one-stop-shop - NZBA members and their staff can access discounts ranging from 10 to 50% off the OfficeMax recommended retail prices on over 20,000 items including office supplies, furniture and ergonomic products, a wide range of technology including Apple iPads, coffee, tea and lunchroom supplies, cleaning and hygiene products. Click here to view OfficeMax's current special offers. NZBA members click here for more information on accessing the Office Max member benefit. NZBA members receive a cost plus 10% discount on Noel Leeming products plus Flybuys. Click here to view the Noel Leeming product range. NZBA members click here for information on accessing the Noel Leeming member benefit. Dragon personal speech recognition solutions, can increase productivity & positively impact the transcription process. For a limited time, Sound Business Systems are offering NZ Bar Association members 15% off the standard purchase price of Dragon Legal. Ashley Marsh is a lawyer of the Northern Territory and practices in commercial and corporate law at the firm Bowden McCormack. Ashley has extensive experience working with individuals, public and private companies, incorporated associations and government departments. See how Dragon speech recognition helps Ashley to be effective and productive. Mark Robinson is a Senior Counsel in Sydney with Maurice Byers Chambers. He has used Dragon since 1993 in his practice. Mark provides a great demonstration here. The Hon Michael Kirby AC CMG is a long-time Dragon user. Here, he gives us a quick overview of his experience using Dragon. See Dragon in action on screen. Revolutionise your filing system. 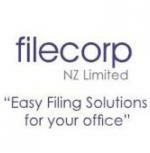 Filecorp provide a wide range of record and information management solutions to help you save time, space and money. Click here for more information about Filecorp. NZBA members click here for more information on accessing substantial discounts on most products, and a no obligation consultation. Previously known as Neville Newcomb Reprographic Centres, Newcomb Digital has been providing print and copy for the Auckland legal community since 1948 and understand the unique demands of the legal profession. We have built our reputation on trustworthy confidential service with a local face. 1. Copy from existing hard copy. 2. Print from digital file. 4. Scanning from hard copy. 5. Large format presentation prints for litigation. Prints onto canvas etc. 7. Pull up Banners and Signage banners. 8. Full finishing services-laminating, mounting, binding, etc..
9. Own internal courier service for security of your print work. Click here for information about Newcomb Digital’s Services. NZBA members are offered a 15% discount on all inhouse services. Work above a value of $50 will get free pick-up and delivery in the Auckland CBD and local environs within 4kms by road from their Parnell base. NZBA members click here for more information and how to access the NZBA member benefit pricing. Moore Stephens Markhams acts for a large number of barristers and can assist them with accounting and financial services. Click here for more information on Moore Stephens Markhams services. NZBA members receive a one hour free consultation and 10% off the first year’s accountancy fee. NZBA members click here for more information to access this member benefit. Legal Accounting Bureau offers NZBA members reduced joining fees. NZBA members click here for more information on accessing the Legal Accounting Bureau member benefit. Rocketspark is a website builder and makes it easy for anyone to build a great looking website and keep it updated with fresh content. Save thousands on the setup of a new website. Click here to read more about Rocketspark. NZBA members receive a 10% discount on design costs and monthly subscription for website development and hosting. NZBA members click here for more information on accessing the Rocketspark member benefit. DTI offers a full range of transcription options and complementary services such as translation and proofreading. DTI offers 10% discount on all transcription for NZBA members. NZBA members click here for information on accessing this member benefit. If you need typing or document formatting done, an experienced Legal Secretary/PA is available to assist. Fast turnaround of work, accuracy and confidentiality assured. A 5% discount on hourly rate is offered to NZBA members. NZBA members click here for information on accessing this member benefit. Mobile Art Gallery leases and sells contemporary art from some of New Zealand's leading and emerging artists. The gallery's core focus is on servicing the needs of corporate offices and they work with clients to find the right artwork to enhance work spaces. Click here to read more about Mobile Art Gallery. NZBA members click here for more information on accessing the Mobile Art Gallery member benefit offer.